For other uses, see Smirnoff (disambiguation). Smirnoff (/ˈsmɪərnɒf/; Russian: [smʲɪrˈnof]) is a brand of vodka owned and produced by the British company Diageo. The Smirnoff brand began with a vodka distillery founded in Moscow by Pyotr Arsenievich Smirnov (1831–1898). It is now distributed in 130 countries and produced in several countries including Albania, Brazil, Honduras, India, Ireland, Italy, Latvia, Mongolia, the Philippines, the United Kingdom and the United States. Smirnoff products include vodka, flavoured vodka, and malt beverages. 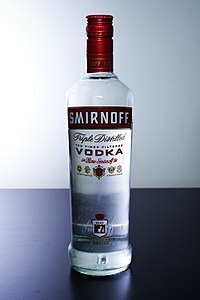 In March 2006, Diageo North America claimed that Smirnoff vodka was the best-selling distilled spirit brand in the world. In 2015 India's Officer's Choice overtook Smirnoff vodka to become the world's largest selling spirit brand. In 2014, Smirnoff was chosen as the best selling vodka across the world. The vodka is made using a traditional charcoal filtration method developed by P.A. Smirnoff. Recipe No. 21 that was created by P.A. 's son Vladimir after escaping Russia during the October Revolution. Pyotr Arsenjevitch Smirnov founded his vodka distillery in Moscow in 1864 under the trading name of PA Smirnoff, pioneering charcoal filtration in the 1870s, and becoming the first to utilize newspaper ads along with charitable contributions to the clergy to stifle anti-vodka sermons, capturing two-thirds of the Moscow market by 1886. His brand was reportedly a Tsar favorite. When Pyotr died, he was succeeded by his third son Vladimir Smirnov (1875–1939). The company flourished and produced more than 4 million cases of vodka per year. In 1904, the Tsar nationalized the Russian vodka industry and Vladimir Smirnov was forced to sell his factory and brand. During the October Revolution of 1917, the Smirnov family had to flee the country. Vladimir Smirnov re-established a factory in 1920 in Constantinople (present day Istanbul). Four years later he moved to Lwów (formerly Poland, now Lviv, Ukraine) and started to sell the vodka under the contemporary French spelling of the name, "Smirnoff". The new product sold marginally well but not nearly as it had in Russia prior to 1904. An additional distillery was founded in Paris in 1925; however the company was a shadow of its former self. In the 1930s, Vladimir met Rudolph Kunett, a Russian who had emigrated to America in the 1920s and became a successful businessman in New York City. The Kunett family had been a supplier of grains to Smirnoff in Moscow before the Revolution. In 1933, Vladimir sold Kunett the right to begin producing Smirnoff vodka in North America. He then returned to the United States, quit his sales job, and established his first North American distillery in Bethel, Connecticut, USA in 1933. However, the business in America was not as successful as Kunett had hoped. In 1938 Kunett could not afford to pay for the necessary sales licences, and contacted John Martin, president of Heublein. Heublein was a company that specialized in the import and export of liquors and foreign foods. Using the $14,000 that the Heublein company made from a new product that ended up saving them from bankruptcy, Martin bought the rights to Smirnoff in 1939. His board thought he was mad. Americans were traditionally whiskey drinkers unfamiliar with vodka and so sales were very slow. In a marketing move they changed the product to use whiskey corks instead and branded it as a "white whiskey" with "no taste, no smell". Sales picked up considerably after that. In 1982, the R. J. Reynolds Tobacco Company acquired Heublein Inc. for $1.4 billion. RJR Nabisco sold the division to Grand Metropolitan in 1987. In 1985 Heublein Corporate Audit Manager Hanson J Kan had recommended to Heublein that they buy out the Grand Metropolitan IDV Smirnoff licensee with its global licensee locations. Grand Metropolitan merged with Guinness to form Diageo in 1997. A bottle of Smirnoff Red Label vodka. In 1990, after the Berlin Wall was demolished, Helmut Kohl made a deal with Soviet President Mikhail Gorbachev allowing the reunification of Germany provided that the Soviet army could remain in East Germany, due to a pre-existing security agreement between the German Democratic Republic and the USSR; such arrangements were to be paid by West Germany for three years. Suddenly, 500,000 Soviet soldiers were paid in hard currency and had almost nothing to do except drink. They then proceeded to spend their currency on Marlboro cigarettes, Levi jeans and Smirnoff vodka. The US-made variety of Smirnoff vodka was especially popular. The London office of Heublein was inundated with orders and the Vice President, Jeremy Collis, set about exploiting this "gusher" to the fullest extent possible. Huge in-store Smirnoff displays were set up in the Russian army stores and the officers' messes were renamed Smirnoff Clubs. Individual messes started serving in excess of 200 litres a night of Smirnoff. The Soviet forces became the biggest market in Europe for Smirnoff outside the UK. Smirnoff was shipped to Germany at the rate of 20,000 bottles a day. Moskovskaya and Stolichnaya's market share in Germany dropped from 100% to almost nothing. Seeing the popularity of Smirnoff amongst the Russian troops, Collis set about trying to sell Smirnoff vodka directly into the USSR. The entire vodka market in the Western world at that stage was 60 million cases (Source: M. Shanken Publications: "Impact" 1991) but the USSR market was believed to be over 200 million cases (Source: "Impact"1991). The first containers were shipped into Leningrad in 1991 where Collis had appointed a distributor, Empire Brands Inc. In 1985, Heublein Corporate Audit Manager Hanson J Kan recommended to Heublein that they buy out the Grand Metropolitan IDV Smirnoff licensee with its global licensee locations. But in 1987, Grand Met bought out Heublein including the global Smirnoff operations from RJR Nabisco. Empire Brands was established by Sergey Titov, a former interpreter with no prior commercial experience. In Soviet Russia almost no one had 'commercial experience' so Titov became a model for expanding distribution across the country. Collis went from town to town trying to find suitable individuals who could be taught how business worked - buying, warehousing, distributing and selling at a profit. The plan was to establish approved distributors in each major town and give them exclusive rights for that town because there were numerous towns with populations over 100,000 which each had the potential to be as large a market for Smirnoff vodka as the whole of Belgium or The Netherlands or a US state the size of Connecticut. Outside the Soviet state apparatus, there were no national organisations that could market and distribute Smirnoff. The demand for Smirnoff vodka was such that if properly managed and the opportunity grasped, the Russian market alone could double the size of IDV, already the biggest drinks company in the world. The Communists had banned Smirnoff from Russia for seventy years and in the most extreme example of 'denial marketing' this had created both awareness and demand on an extraordinary scale. Every Russian had heard of Smirnoff vodka and everyone thought it must be the best because they weren't allowed to have it. Collis believed that in 1991, selling Smirnoff in the USSR represented the biggest opportunity for a consumer product in the history of marketing. But he then made a big mistake by telling this to the Board of IDV. As a consequence, every director in IDV wanted to be part of this amazing success story and Collis found himself being squeezed out by other directors with no knowledge or experience of either the USSR or the brand. One director in particular managed to persuade the Board that exclusive distribution rights should be given to one man in Moscow - a Greek mafioso character called Spiros with no marketing or distribution experience, staff, or infrastructure. Many people subsequently believed that major corruption must have been involved. This appointment proved disastrous as established customers were cut off from buying Smirnoff unless they made illegal hard currency payments to Spiros's company. During the 1990s one of Piotr Smirnov's descendants started producing Smirnov (Смирновъ) vodka in Russia, claiming to be "The Only Real Smirnov". After a number of lawsuits, Smirnoff successfully reclaimed its trademark, while in 2006 Diageo concluded a joint venture deal with the Smirnov company. The Smirnoff company had the naming rights to the Smirnoff Music Centre, a concert amphitheater in Dallas, Texas from 2000-08. They also sponsored the Smirnoff Underbelly, a major venue at the Edinburgh Fringe. In the late-1990s, Smirnoff introduced a series of new products onto the UK and later the European and North American market, which quickly became popular among young people, especially within the club scene (See "Alcopops"). There are two different products by the name of Smirnoff Ice. One, sold in France and the United States, is a citrus-flavoured malt beverage (5.0% ABV) with variants in "Original," and "Triple Black." The other, sold in Europe (excluding France), Latin America, Australia and Canada, is a premixed vodka drink. It also has variants in "Original" and "Black Ice" (or in some markets, "Triple Black" or "Double Black"), ranging from 4.5% in the UK, to 7% ABV in different markets. The Smirnoff Ice marketed in the United States does not actually contain vodka according to the official Smirnoff website. It is more similar to beer than to vodka, primarily because it is brewed. However outside of the USA and countries who receive US manufactured vodka it does contain Smirnoff Vodka No. 21. Smirnoff Ice Twisted was a spin-off of the American Smirnoff Ice that featured flavors such as Mandarin Orange and Green Apple. The confusion in branding between Smirnoff Twist Vodka and Smirnoff Twisted Malt Beverage resulted in the decision to drop the "Twisted" from the flavored line of Smirnoff Ice. Current[when?] Smirnoff Ice flavors include Watermelon, Wild Grape, Passionfruit, Mango, Triple Black, Pomegranate Fusion, Arctic Berry (Blueberry), Green Apple Bite, Strawberry Acai, Pineapple and Raspberry Burst. It is sold in 22 oz. [650 ml] bottles and six-packs of 12 oz. [355 ml] bottles. The next line of Smirnoff's malt beverages to be produced was "Raw Teas", similar to the brand Twisted Tea. It comes in flavors such as Lemon, Peach, Raspberry and Green Tea. This product line has been marketed most notably with the "Tea Partay" music video and website. It is sold in six-packs of 12 oz. [355 ml] bottles. Smirnoff Source, a lightly carbonated beer-alternative, was released in May 2007. It is citrus-flavoured and made with alcohol (3.5% ABV) and spring water and is sold in 4-packs of 1-quart [947 ml] bottles. A line of 22 flavoured vodkas (based on the No.21 Red Label) with the "Twist" moniker appended on the end of the name have also been introduced. Flavours include Green Apple, Orange, Cranberry, Raspberry, Citrus (Lemon), Vanilla, Strawberry, Black Cherry, Watermelon, Lime, Blueberry, White Grape, Melon (Honeydew/Cantaloupe), Pomegranate, Passion Fruit, Pear, Peach, Pineapple, Mango, Coconut, and most recently Amaretto. In 2004, Smirnoff trialled a new blend of vodka in the UK and Canada called Smirnoff Penka. Marketing and distribution was handled by The Reserve Brands of Diageo plc. As of 2007[update] Penka continues to be available in the UK. In a 2005 New York Times blind tasting of 21 world-class vodkas, Smirnoff won as the "hands-down favorite". In 2010, Smirnoff introduced the Cocktail Range. Pomegranate Martini with Meyer Lemon-flavoured Liquor and pomegranate juice, Mojito with a dash of mint and Kaffir lime and Grand Cosmopolitan with cranberry juice. Tuscan Lemonade and Savannah Tea were later added. A study in 2013, shows that Smirnoff malt beverages were the second-most popular brand specific alcohols consumed by underage youths in the United States. Smirnoff malt beverages (17.0%, 95% CI 12.9 to 21.1%). The latest addition is the Smirnoff Sours vodkas, introduced in 2014. Flavors available are Fruit Punch, Watermelon, Green Apple, and Berry Lemon. In 2016, Smirnoff introduced two new Smirnoff Ice flavors: Electric Mandarin and Electric Berry. Also in 2016, Smirnoff introduced the new Spiked line, available in Original, Screwdriver and Hurricane Punch, as well as their Sourced line of fruit juice vodka, available in Ruby Red Grapefruit, Pineapple and Cranberry Apple. Smirnoff's number and other information is shown at the bottom of the label. Depicted here is No. 63 — Smirnoff Twisted V Green Apple. 21: Smirnoff Red Label, 37.5% or 40% ABV (location dependent). 27: Smirnoff Silver Label Vodka, 45.2% ABV. 55: Smirnoff Black, 40% ABV. A small-batch vodka that is produced in copper stills. 60: Smirnoff Vladimir, 40%. Available only in Poland. The basic Smirnoff vodka — number 21 — has performed well at spirit ratings competitions. It was awarded a double gold medal (the highest award) at the 2009 San Francisco World Spirits Competition. These are numbered Smirnoff vodkas with flavouring added. 21: Smirnoff North (previously Smirnoff Norsk). This is the classic Smirnoff No. 21 Red Label vodka flavoured with Nordic berries. In the United Kingdom and some other markets, it is called Smirnoff Nordic Berries. 21: Smirnoff Classic Mix. Smirnoff No. 21 vodka premixed with either lime soda or cola in a 70-cl bottle. 21: Smirnoff "Expertly Mixed". Smirnoff No. 21 vodka premixed with cola or tonic water in a 250-ml can. Cola mix is 6.4% ABV, tonic is 7.5% ABV. 21: Smirnoff Vodka and Cranberry Juice. Smirnoff No. 21 vodka premixed with Ocean Spray Cranberry Juice in a 250-ml can. 21: Smirnoff Mule. Smirnoff No. 21 vodka premixed with ginger beer and lime, 4.8% ABV. 21: Smirnoff Espresso. Coffee-flavoured Smirnoff No. 21 vodka, 37.5% ABV. 21: Smirnoff Sours Berry Lemon. Smirnoff No. 21 Red Label vodka flavoured with berry and lemon in a 500-ml, 750-ml, or 1 liter bottle. 57: Smirnoff Dark Roasted Espresso. Espresso-flavored vodka, 50% ABV. 57: Smirnoff Spiced Root Beer. Root beer-flavored vodka, 50% ABV. 71: Smirnoff Ice Triple Filtered malt beverage, 5.6% (4% in some locations) ABV. 72: Smirnoff Ice, 5% ABV. In the United States, it is a malt beverage; elsewhere it is vodka-based. Labeled as "Spin" in South Africa. 73: Smirnoff Black Ice, 7% ABV. In the United States it is a malt beverage; elsewhere it is vodka-based. Labelled as "Storm" in South Africa. 74: Smirnoff Ice Triple Black. 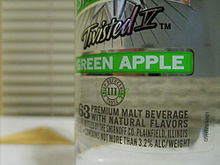 A lime-flavoured malt beverage sold in the United States, 4.5% alcohol. 85: Smirnoff Twisted Raspberry. Sold in Canada. 120: Smirnoff Ice Spice. Sold in Japan. Some Smirnoff products do not have a number on the label. Smirnoff Fluffed Marshmallow. Marshmallow-flavored vodka, 30% ABV. Smirnoff Iced Cake. Cake-flavored vodka, 30% ABV. Smirnoff Kissed Caramel. Caramel-flavored vodka, 30% ABV. Smirnoff Whipped Cream. Whipped cream-flavored vodka, 30% ABV. Smirnoff Root Beer Float. Root beer float-flavored vodka, 30% ABV. Smirnoff Cinna-Sugar Twist. Cinnamon sugar-flavored vodka. 30% ABV. Smirnoff Wild Honey. Honey-flavored vodka. 30% ABV. Smirnoff White. Premium Vodka Distilled at Sub-Zero Temperatures for a smoother taste. 41.3% ABV. Smirnoff Sourced Ruby Red Grapefruit. Grapefruit-flavoured vodka with real juice added. Smirnoff Sourced Pineapple. Pineapple-flavoured vodka with real juice added. Smirnoff Sourced Cranberry Apple. Cranberry-Apple flavoured vodka with real juice added. Smirnov (Russian: СмирновЪ) can be seen as the Russian version of Smirnoff vodka. It is made by the Smirnov Trading House, a company that is part of a joint venture by Russia's Alfa Group and Diageo set up in February 2006. The full title of the Smirnov Trading House is The Trading House of the Heirs of P.A. Smirnov. Smirnov vodka was launched in 1991 by Boris Smirnov, a scion of Pyotr Smirnov, the original producer of the spirit. It was first labeled as a "table wine" rather than a vodka to avoid any conflict with Smirnoff. After many lawsuits, which resulted in Diageo's brand being temporarily banned in the Commonwealth of Independent States from 2002 to 2006, the Russian brand became a "sister product" of Smirnoff vodka. The label lists 1860 (the year Pyotr's father Arseniy founded their first wine cellar in Moscow), rather than 1864 (the year Pyotr founded his first vodka distillery), as the founding date of the company. Their premier brand Smirnov Titul' has the year 1886 on the label, the year P.A. Smirnov received the title of "Purveyor to the Imperial Court" - making them the exclusive providers of vodka to the Tsar. In 2017, model Chrissy Teigen starred in video ads for Smirnoff vodka. These are not to be confused with Smirnoff's Red-, Gold-, and Black-label vodkas. Smirnov №21 Vodka [50 cl, 70 cl or 1 liter bottle (40% ABV)] Red and White label with gold border. The vodka, like its Western cousin, is charcoal-filtered. Smirnov ЗОЛОТАЯ (Zolotaya > "Golden") Vodka [61 cl bottle (40% ABV)] Brown and Tan label with gold border. The vodka passes through a second gold-alloy filter for a smoother taste. Smirnov ИМПЕРИАЛЪ (Imperial > "Imperial") Vodka [61 cl bottle (40% ABV)] Black label with silver border. Comes in a cardboard gift box. The vodka is made in small batches and uses natural honey rather than sugar as an ingredient. Smirnov ТИТУЛЪ (Titul > "Title") Vodka [50 cl or 70 cl bottle (40% ABV)] Crimson label with silver border and sculpted bottle. The 70 cl bottle comes in a cardboard gift box. The small-batch vodka is double-distilled in a copper alembic for a smoother finish. ^ Himelstein, Linda (2010). The King of Vodka: The Story of Pyotr Smirnov and the Upheaval of an Empire. HarperCollins. ISBN 9780060855918. ^ Smirnoff India Home. Smirnoff.co.in. Retrieved on 2013-12-23. ^ "Top 10 best-selling vodka brands". www.thespiritsbusiness.com. Retrieved 30 May 2017. ^ Ryan, Bill (19 February 1995). "'Smirnoff White Whiskey -- No Smell, No Taste'". The New York Times. Retrieved 8 May 2013. ^ Hicks, Jonathan (17 January 1987). "Grand met to buy nabisco's heublein". New York Times. Retrieved 19 June 2009. ^ Fabricant, Florence (22 September 1995). "INTERNATIONAL BUSINESS; Russian Court Blocks a Use of Smirnoff Name". The New York Times. Retrieved 7 April 2010. ^ VODKA | Smirnoff. Us.smirnoffice.com. Retrieved on 2013-12-23. ^ Asimov, Eric (26 January 2005). "A Humble Old Label Ices Its Rivals". The New York Times. Retrieved 7 April 2010. ^ Smirnoff introduces ready-made cocktails - Famous Magazine - Yahoo!7 Lifestyle. Au.lifestyle.yahoo.com (2010-01-27). Retrieved on 2013-12-23. ^ Michael, Siegel; William, DeJong; S., Naimi, Timothy; K., Fortunato, Erin; B., Albers, Alison; Timothy, Heeren; L., Rosenbloom, David; Craig, Ross; Joshua, Ostroff (1 July 2013). "Brand‐Specific Consumption of Alcohol Among Underage Youth in the United States". Alcoholism: Clinical and Experimental Research. 37 (7): 1195–1203. doi:10.1111/acer.12084. ISSN 1530-0277. PMC 3655157. PMID 23398328. ^ "SFSpiritsCom.com Website". Retrieved 5 August 2009. ^ Diageo launches Smirnoff Espresso in duty-free. Dfnionline.com. Retrieved on 2013-12-23. Wikimedia Commons has media related to Smirnoff vodka. This page was last edited on 3 April 2019, at 02:33 (UTC).